Facebook's Empty Chair Problem - Spotlight #276 | Silver Beacon Mktg. Good Monday morning. It’s December 3rd. #GivingTuesday was a hit last week. Thank you for supporting our friends at SPARC. They reached their goal. Overall, donors gave $320 million to charity, according to The Chronicle of Philanthropy. More than a third of that was on Facebook. Also, Hanukkah started at sundown local time yesterday. Chag Sameach! Marriott’s data breach of 500 million records got the headlines, but the USPS also had a slip up that caused them to expose the records of 60 million people. Meanwhile, the EU’s Data Protection Commissioner accused LinkedIn of misusing 18 million email addresses to target individuals with ads. Akami reports that 45,000 older routers have been compromised by a known vulnerability. Those routers connect behind the scenes to millions of devices. The best way to protect yourself is to have new hardware or ask your Internet service provider to help you determine if your router has up-to-date firmware. Google is now providing answers without any search results in some cases. Google confirmed to Search Engine Roundtable that they would display calculations or information without any links to web pages when they have a “high degree of confidence” that the searcher wants a calculation, unit conversion, or local time. Details and samples here. We ran down Facebook’s latest scandals last week. 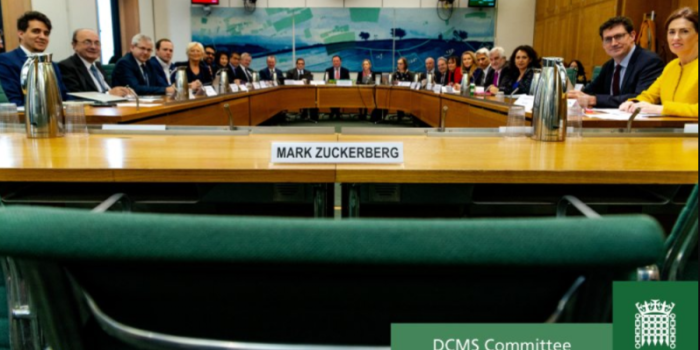 Although everyone knew that Mark Zuckerberg would not be testifying to Parliament last week the UK Parliament’s Digital, Culture, Media and Sport Committee tweeted out this image of an empty chair with Zuckerberg’s name in front. That’s the subtitle of a 2,500 word memo that black Facebook exec Mark Luckie sent to all Facebook employees on November 8th. Luckie, who was planning to leave his role as Strategic Partner Manager for Global Influencers, wrote that the company’s staffing and treatment of many of its black employees is lacking. Luckie cites data that black employees only make up about 4% of Facebook’s employee base. “In some buildings, there are more ‘Black Lives Matter’ posters than there are actual black people,” he writes before describing anecdotal but pain-filled examples like seeing employees tap or hold their wallet or put their hands in their pockets when he passed by. Inertia exists in any enterprise that serves a double-digit percentage of the planet’s population. But Facebook also faces strong opposition from product-oriented tech companies like Apple, the EU and U.S. governments, and a growing chorus of tech voices including Swisher, Jaron Lanier, and Tristan Harris. We expect there to be data privacy regulations in the next 2-3 years. Facebook execs already support that idea. Getting industry-wide engagement will be more difficult, but we know that the federal government wants to create advertising regulations beyond what the Federal Trade Commission currently manages. Smart consumer-centric organizations won’t leave Facebook, and they shouldn’t. Whether business or government-facing organizations leave is a judgment call based on whether a Facebook presence increases the organization’s profits. If you’re looking at the issue from a strictly consumer perspective, this is probably the most open your data will be on the site. But even this week, a press release arrived touting new availability for third party data to be used to target you, friendly reader, on Facebook based on your offline purchases. Google employees are airing their anger at their employer working with the Chinese government to build a censored search engine called Dragonfly. More than one thousand of them signed an open letter to the company in August. A new open letter to the company says that Google will be complicit in human rights abuses if it allows some features like identifying searchers to be launched. You can read the letter here. Another letter to a tech company started gaining momentum this weekend when eight Democratic lawmakers wrote to Amazon over concerns about its facial recognition software. Rep. Jimmy Gomez (D-CA) says it’s the third time he’s asked the company for answers. NBC has details. Can you tell the difference between a computer generated image and a photograph? I joined nearly 60% of people in failing to get half the answers correct in an online test from software company AutoDesk. Try your hand at their Fake or Foto quiz.